However, I’m sending the trailer back to the trailer dealer so they can flash the whole underside of the trailer and paint it to keep the elements out (road grime, water, snow, ice, salt, insects, etc, etc) from getting in under my house as I drive (and while stationary). This flashing also gives the closed-cell spray foam something to spray to and actually seal up any gaps between metal sheets, etc (subfloor OSB will be installed directly on top of the steel cross-members, maximizing my vertical interior height in my tiny house and providing a very solid flooring system). Here’s a little step by step of what I was doing to get it ready for the flashing. I took 2×8’s and stapled on some polyurethane foam strips were the wood be in contact with the metal trailer frame (because it would help reduce thermal bridging and was easy). I then screwed them into place on the sides of the trailer, attaching them to the angle iron on the sides. This again allowed to close in the floor cavity from top to bottom (sheet metal on the bottom and angle iron on the top) and gave me a few inches still under the angle iron to secure future all-threads, screws and/or bolts to secure the walls to the trailer in the future. See the pictures to get a better idea of what I mean. The wall sheathing will then cover this remaining exterior gap between the angle iron and the sheet metal flashing, closing that in as well. Here’s the final product once I got my trailer back again from the manufacturer who installed the rear jacks and flashing underneath. The 24 awg flashing was very strong, strong enough that you could walk on it. I then put the front stabliziers down and the rear jacks to level the trailer and get it ready for insulation and subflooring which you’ll find in the next post. Thanks for reading – what do you think so far? Let me know in the comments below (video was a little shaky, I know… lol). Quick video here on Installing the subfloor in my 32-foot Gooseneck Tiny House Trailer (THOW). More pics and info to come but I wanted to get this video up since it’s been a while already. I appreciate you! More pics and videos to come! Let me know what you think in the comments at the very bottom of this page, looking forward to hearing your thoughts! Thanks! And be sure to subscribe to my YouTube channel for the latest Tiny House Build update videos! 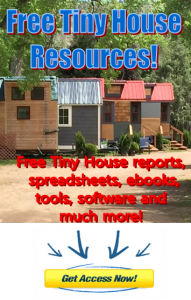 PS> Excited to get your own tiny house? Have you figured out what you’re going to do to bring in income while living in it? Watch this video here – it could help! The perks and benefits of the Tiny House Lifestyle are clear: FREEDOM! So, how can one begin the Tiny House journey if they’re short on funds? So, how do you make money when you’re traveling around in your tiny house without a job? Got the subfloor of my tiny house insulated with spray foam the other day! Here’s a short video I made with Bob, the owner of the company, as they were spraying the foam (only took 90 minutes for them to do the whole 40 feet, ready for the OCB subflooring!). I hope you enjoyed the additional information about in the video above about insulating a tiny house with spray foam insulation, whether open cell or closed cell insulation. One other thing Bob forgot to mention was how environmentally friendly this stuff now is. It costs him a little more to provide this superior product, but its important to him that this foam be non-toxic and it degrades with simple ultra-violet light (so make sure you cover your insulation from the sun or it will start to disappear on you!). It’s really good stuff. More pics and info will be available on my gotinybefree blog here. If you’d like to know more about the company or have any questions, let me know in the comments below or send me a message here on facebook, I’m happy to share more about it.I appreciate you. PS> If you’re looking for a way to finance your tiny house living and travels, check this out – click here.